Just completed some snowy tree landscape images for the web site (should be available for viewing from Tuesday). 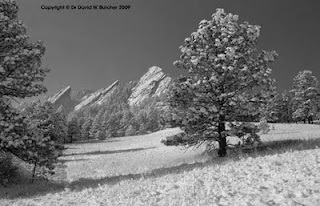 Taken mainly around Boulder in Colorado they also include the Flatiron mountains (just on the edge of the city) under quite different conditions. Finally finished processing the films from recent trips. These included the last few from Edinburgh as well as Northumberland castles and the Yorkshire Dales near Bolton Abbey. Will try and scan Edinburgh shots later this week.